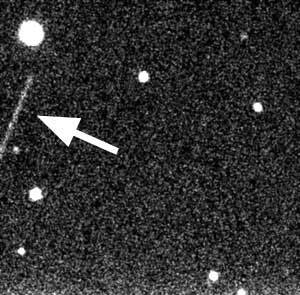 The asteroid 2004FH passed within 43,000km of the Earth last night (18th March 2004). The flexible schedule of the LT meant after being alerted by Alan Fitzsimmons from QUB, LT Staff on site (Robert Smith, Jon Marchant, Alan Scott and Stuart Bates) were able to image it at short notice, and obtained this image. In this five second exposure, the fast moving asteroid can be seen as the long trail entering the frame from the left (arrowed). The images obtained will be used to help refine the orbit of the asteroid.